Top Brands – This study, compiled by Interband, charts the growth of the world’s top brands according to brand value from 2001 through to 2018. Interbrand’s methodology for ranking brands involves around three key components: financial forecast, role of brand and brand strength. These factors combined determine a brand’s value. It’s worth noting that this data is more than just a financial ranking. As well as considering a company’s economic profit, the study also takes into account other factors, such as a brand’s ability to create loyalty and sustainable demand, which helps to explain why Coca Cola remained top from 2000-2012. That doesn’t mean it was the most profitable, but it was the biggest brand overall during that period. To read the methodology in full, click here. This video charts the rise of brands in a slick video, but things move fast, so Plugsville have broken down the top 15 brands year-by-year to make things easier to digest. The first eight years captured in this study served up the same top four most valuable companies; Coca Cola, Microsoft and IBM. The former company remained on top for 11 years straight. 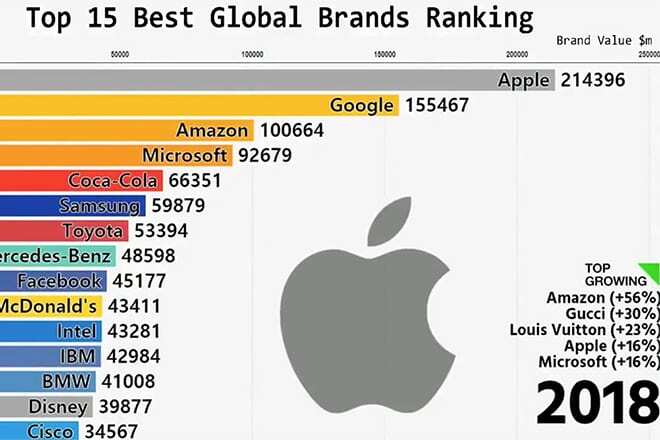 By 2017, just one of those companies, Microsoft, ranked in the chart, dropping 9 places to #11 after being one of the world’s most prominent brands during the early part of this millennium. As the internet became more prominent, the level at which companies rose or dropped down the rankings became more frequent too. Google entered the charts in 2008 at #10 and never dropped lower, peaking at #2, currently lurking behind Apple. The iPhone revolution laid the foundations for mesmeric profit levels thereafter, as the technology giant became the world’s first trillion dollar company in August 2018 after its rise in share price pushed it past the one trillion dollar valuation. That dominance is reflected here, as Apple topped the charts from 2014-2018.